My son, Kaden, loves claw machines. Anytime he sees one at the store he will always ask to play" just ONE time." 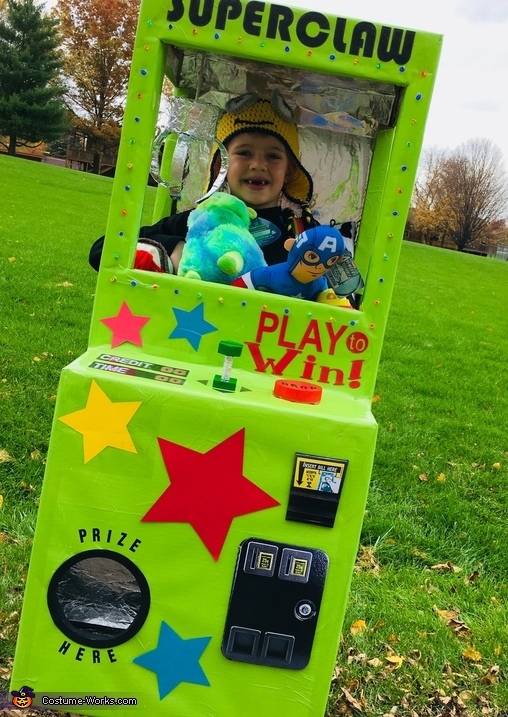 Kaden is the one who came up with the idea of being a claw machine for Halloween. He said he wanted to be the one to award kids prizes from his claw machine. My husband constructed the main part of the claw machine out of two boxes. We covered the boxes with two green plastic tablecloths. Holes were made around the front window to poke battery-powered lights through them. Suspenders were attached inside of the box so our son wouldn't have to hold up the box with his hands. The claw was constructed out of a plastic peanut butter jar and wrapped in aluminum foil. Aluminum foil was also placed inside on the "walls" of the claw machine and on the prize flap at the bottom. A red peanut butter lid was used for the "DROP" button. Wooden toy nuts and bolt were used for the joy stick. We printed out the money slot pictures from the internet and wrapped them around cardboard to make them stick out more. Stars and letters were cut out from my scrapbooking machine and glued or taped to the outside. We added stuffed animals for prizes from our son's stuffed animal collection and he placed on a minion hat to also become one of the prizes. The prize shoot functioned as his "treat bucket." The majority of the materials we already had on hand. We only had to purchase the battery-powered lights, which cost less than $5. The costume took approximately 5 hours to make. Everyone loves this costume and says how creative and awesome it is. Multiple people asked to take pictures of it. Kaden had many people tell him that his costume was the best one they had ever seen. I had a mom come up to me and tell me that Kaden's costume has inspired her and her boys to make homemade costumes next year!